I don’t have any particular plans for this image, so members of the EDL, the DDL, the LDF, the GDL, BPE, Mission Europa, Politically Incorrect, ICLA, or any other group that participated in yesterday’s demo: please borrow if needed as a suitable logo for a phenomenally successful event. As we walked around Amsterdam that March weekend, I thought about those Dutchmen emigrating to Canada, Australia and New Zealand. Unlike Muslims in Europe, they’d integrate quickly — they’d find work, contribute to society, fit in. They already spoke English. Yet what, years from now, would their children think? Their grandchildren? What, for that matter, would they themselves think when they lay in bed at night, far from home, their minds flooding with images of the small, loving tended land of their birth, with its meticulously laid-out roads and walks and bicycle lanes, its painstakingly preserved old houses, its elaborate, brilliantly designed systems of dikes and canals. The irony was tragic: having protected themselves with nothing short of genius from the violence of the sea, having instituted a welfare system meant to safeguard every last one of them from so much as a moment’s financial insecurity, and having built up a culture of extraordinary freedom and tolerance that promised each of them a life of absolute dignity and perfect equality, post-war Dutch men and women had raised up their children into tall, strapping, healthy, multilingual young adults — veritable masters of the world for whom (they were confident) life would be safe, pleasant and abundant in its rewards. They seemed to have brought Western civilization to its utmost pinnacle in terms of freedom and the pursuit of happiness, and the road ahead seemed to stretch to the horizon, straight, flat, smooth, and with nary a bump. And yet they’d turned a blind eye to the very peril that would destroy them. 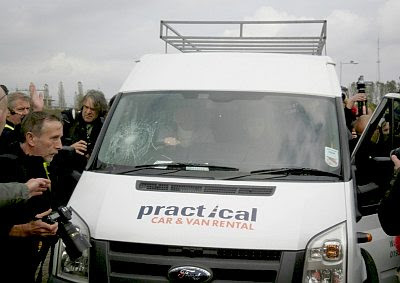 According to EDL people who were passengers in the minivan, the British police had accompanied the EDL to Amsterdam to offer them what protection they could. When the EDL guys had to abandon their van and run for it, and the Dutch police declined to protect them, the Metropolitan Police beckoned their compatriots over to their own police vehicle and gave them protection while accompanying them the rest of the way to the venue. 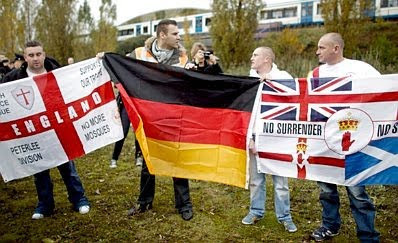 A little while later the British police assessed the situation and determined that it would be very difficult to protect the EDL much longer, given the presence of the violent leftist mob, and the — shall we say — diffident attitude of the Dutch police towards their English visitors. So Tommy Robinson was forced to give an abbreviated version of his speech ahead of schedule, and then the EDL departed. This report casts the Metropolitan Police in a new light. The London cops, after all, have often been the object of anger and derision on the part of ordinary Britons who oppose the Islamization of their country and are victimized by the police. But things are not always what they seem, and it appears that the EDL have at least a few friends on the police force — even if those doughty coppers have to travel all the way to Amsterdam to be able to show their true colors. 0:51 This is nothing to do with ‘right-wing extremism’. 0:53 This is freedom to live as we have always lived in the West. 0:58 “[inaudible] people [inaudible] Muslims in general. 1:03 We’re not talking about ‘Muslims in general’; we’re talking about Islam. 1:08 that does not believe in democracy. 1:11 Man-made laws and democracy are not compatible with Islamic law. 1:17 We live in liberal democracies. 1:27 and I see that threatened today. 1:30 Which is why we are here now. Every window was smashed, as bricks, bottles and boots were launched against it. At which point the police stopped the bus and turned the EDL boys out to run a 300-metre gauntlet of vicious hatred and violence. And they had to fight their way through, with no police protection, after which things became even worse. The Dutch police, acting on advice from the British police, stated they could not guarantee their protection, and ordered them to leave the area. So, a freedom of speech rally was curtailed due to left-wing violence, and the EDL were not allowed to practice their democratic right of peaceful protest in the heart of liberal, tolerant Europe. Betrayal. total and utter betrayal, carried out not by Islam, but by our own politicians. A sad day, as Tommy Robinson noted. 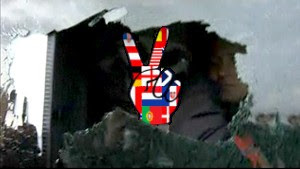 Democracy and Holland were shamed.